The Automatic Liquid Vial Filling & Stoppering Machine in pleasing matt finished stainless steel. The basic unit consists of Turn Table, S.S. Conveyor Belt. Unique co. Eccentric Pre-Gassing, Filling & Post-Gassing S.S. 316 Nozzles highly efficient and precision built S.S. 316 Syringes, Non-toxic Synthetic Rubber Tubings, easy reach compact panel and with No Container No Stopper – No Filling System. Syringe Volume Range: 1 ml. to 5 ml. 2 ml. to 10 ml. and 10 ml. to 50 ml. All parts coming in contact with washing zones / jet are made from SS 316 materials. The MP High Speed Linear Bottle Washing Machine is most ideal for Round Bottles and finds wide application in PHARMA, FOOD BEVERAGES INDUSTRIES. The automatic loading arrangement facilities loading of bottles on to SS wire mesh conveyor through feed conveyor or bottles are pushed manually from feed table. This saves manpower as bottles are feed into pockets automatically. 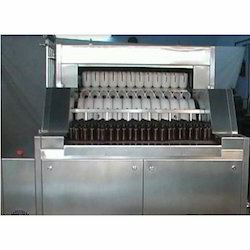 The automatic unloading mechanism consists of unloading bottle continues on to Turn Table (Optional). Three-cycle rinsing allows flexibilities of various wash cycles such as fresh water, dematerialized water etc. as per the rinsing requirement of bottle. All the pumps are made of SS and all the water contact parts are made of SS 316 on a heavy base of SS structure. In tunnel design is such that separation is maintained between feeding zone and discharge zone of the cleaned containers. All the mechanical drives are separated and isolated from the washing zone. Approved materials only are used for construction, together with a careful choice of components, thereby taking in to consideration all aspects of sanitation and consequence complying with the pharmaceutical G.M.P. requirements. The quality of rinsing is ensured through 3 sets of inner and 2 sets of outer nozzles accurately placed to direct the jet at center of the bottle and the bottle comes out with water totally drained with minimum droplets of water. High-pressure spray nozzles ensure perfect wash of Bottles. Totally fabricated from SS Materials, including the basic frame. 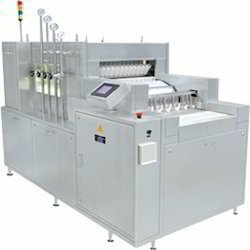 The machine suitable for handling washes of round and flat glass bottle (With help of change parts). Water re-cycling arrangement is possible as per customer’s need. Machine is totally rigid and with stands continuous operation for long working. Hours without any trouble. Higher capacity centrifugal pump to wash bigger container. Third Tank pump can be fitted (optional). Aiming to satisfy our clients, we are offering a quality approved Automatic Vial Filling Machine that is ideal for sealing vial in food and pharmaceutical industry. 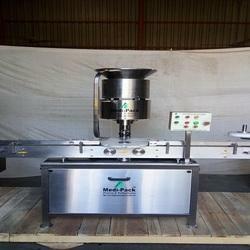 This machine is provided for optimum functional support and features advanced process handling required for variety of small doses of liquids. Our machine has features like no bottle no filling support, stable and reliable performance & high-precision cam meter control. We have marked a distinct and dynamic position in the market by providing a high quality array of Vial Filling and Sealing Machine. Our machine is demanded in the industry for its features like can handle different sizes of products, provides for increased process reliability and easier operations, advanced PLC programmable controller for accurate handling of operations, feed length control through electric eye detection and timer support. This machine comes with quality constant temperature side sealing blades so as to ensure straight and stable sealing line. With our years of experience and knowledge, we are engaged in offering a wide range of Automatic Injectable Dry Powder Filling Machine. 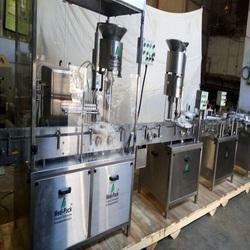 Our offered machine is compact model used for filling of Dry Powder Injectable in to vials. This machine is suitable for filling free flowing powders & granules, owing to which demanded in various industries. 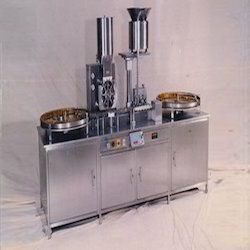 We provide this machine on different specifications keeping in mind the needs of customers. 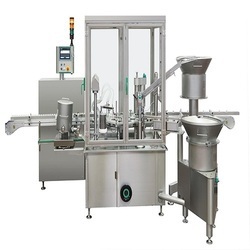 The Automatic vial sealing machine is precision built on sturdy welded steel frame completely enclose in stainless steel sheet and doors are provided to facilitate the servicing of machine. The feed container moving on conveyor belt are fed into star wheel, bringing the container below the sealing head in the subsequent indexing part, mean while the bottle pickup a cap from the delivery chute of cap feeding bowl, where the body and the neck of the vials are positioned below the rotating head. Where the sealing head is performing perfect operation of sealing. • SS elegantly matt finished body. • Adjustable height of conveyor belt, to align with other machine of the line. • Sealing pressure can be varied to suit different gauges and size of caps. • Self-lubricating UHMW-PE guide profile for low friction wears surface, smooth and noiseless conveying. • SS cladding or hard chrome platting of all exposed parts to ensure long life and resistance against corrosion. • Synchronized A/C drives to synchronize, Conveyor, Star wheel and Platform turret capping bowl. • Adjustable bottle height gauge for easy and quick setting.